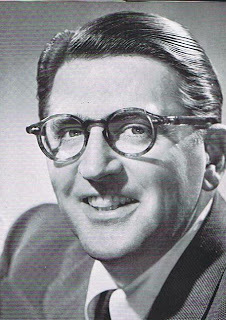 Meredith Willson was a band leader and conductor who then became a radio star and host of his own show. Meredith Willson's Musical Revue aired from 1935 to '53. The road to this distinction passed through work in the trenches. Willson served as the musical director for Tallulah Bankhead's "The Big Show." He also gained some notability as a songwriter, the author of "It's Beginning to Look A Lot Like Christmas," and the Beatles hit "Till There Was You." His was an All-American story, one of a smalltown boy who would travel to New York City wanting to break into show business. Meredith Willson was born in Mason City, Iowa in 1902. Though far from the lights of the big city, he did have a musical environment. His mom taught music lessons, and a childhood friend of his joined him for flute duets. Later, he would use this environment as the inspiration for Music Man. His style became dubbed "Chiffon Swing." Today we celebrate his 1902 birth.